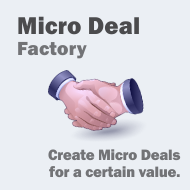 Welcome to the demo for Microdeal Factory, a Microworker Extension for Joomla! Start your microjob website in just a few clicks using Joomla and Microdeal Auction Factory. This is one of the best Joomla based solutions for creating an out-of-the-box Fiverr.com clone! There is an outstanding demand for fixed priced deal websites, where people can sell various goods and services through your website and you can earn Commissions from every completed job! You can easily install our extension as any other Joomla extension and you also get the full support of our Joomla specialists! Test the extension now ! Log in using the quick login buttons and you can even inspect the backend administration! 100% Open Source - you can change any part of the code!